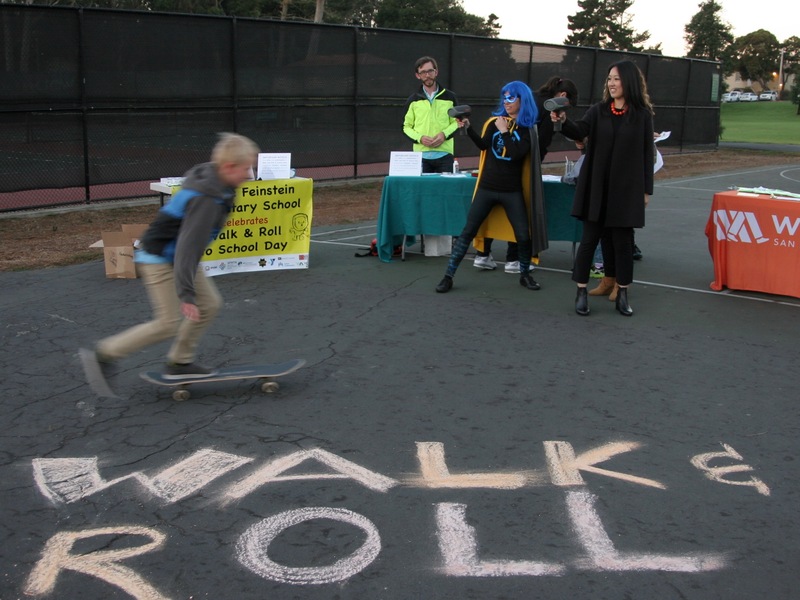 Yesterday some 13,000 San Francisco children at 95 schools walked–and in some cases rolled in wheelchairs–to school as part of the 20th annual Walk-to-School Day (now called “Walk-and-Roll-to-School Day,” at least locally). The event is intended to encourage kids to walk to school and spend more time walking and playing outside. This is part of a global event, held in early October, that encourages children, parents, and school staff to make their communities safer and more pleasant for walking. In San Francisco, the event is co-sponsored by several Bay Area groups, including the San Francisco Safe Routes to School Partnership, the Vision Zero Coalition, Kaiser Permanente, and, of course, Walk San Francisco. Families at one of the schools, Dianne Feinstein Elementary School in the Outer Sunset (see photo at the top), were met by Mayor Ed Lee, District 4 Supervisor Katy Tang, Interim Superintendent Myong Leigh, and other City leaders. 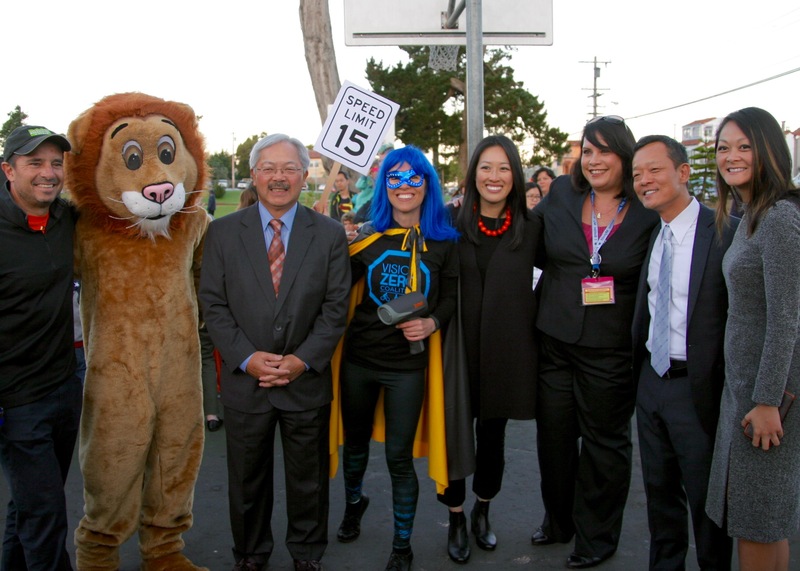 Children were entertained by a new safety super hero character–seen above and below in blue hair–San Francisco’s Vision Zero Hero! 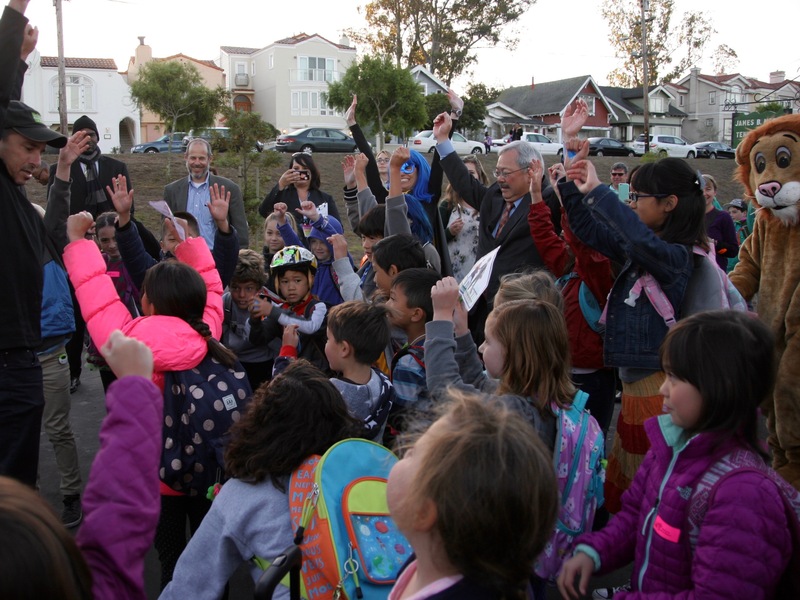 The San Francisco Safe Routes to Schools Partnership…works to support and encourage families to walk to school every day. Walking, biking, and taking transit to school makes up 44 percent of trips to the 35 public schools that are part of the Safe Routes to Schools program, and Walk-and-Roll-to-School Day kicks off the year-long effort to increase that percentage for the health and sustainability of San Francisco’s children and communities. Parents cite traffic safety as the most common barrier to walking. The City’s Vision Zero policy is addressing this through two critical campaigns: one addresses speeding, the most common cause of traffic deaths, with the recently launched Safe Speeds SF enforcement campaign, the second raises critical funding needed to build a safe transportation system. Walk SF’s statement about the second campaign refers to San Francisco Propositions J and K, which will be on the November ballot. J creates a fund for Homelessness and Transportation, and would dedicate money for transit and street safety improvements. Proposition K, meanwhile, will raise the city’s general sales tax by 0.75 percent. “This November, by voting yes on Propositions J and K, voters will have the chance to treat the causes, not the symptoms, of this public health crisis and turn the tide so that families can rely on safe streets,” said Walk San Francisco Executive Director, Nicole Ferrara. Yesterday’s event, meanwhile, dovetailed perfectly with the efforts of all groups advocating for the needs of vulnerable road users. “In San Francisco, taxpayers spend exponentially more on treating those who have been injured—or worse, killed—by traffic crashes than on safety measures that would protect our most vulnerable community members, especially children,” said Ferrara later in the prepared statement. And what about San Francisco’s blue-haired super hero? “‘Vision Zero Hero’ is planning to make a come-back to help right the dangerous conditions on our streets and fight for the safety of all,” added Ferrara in an email to Streetsblog. In addition to the direct dangers presented by automobiles and unsafe streets, advocates point out that children are leading an increasingly sedentary life, setting the stage for health problems in later life, such as heart disease and diabetes. 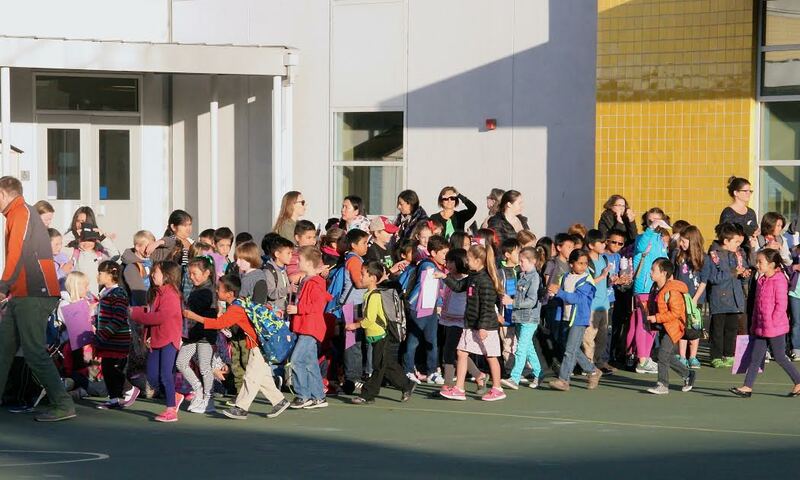 “Approximately 25 percent of San Francisco children are overweight,” says the Safe Routes to School website. A couple more photos of the event at Dianne Feinstein Elementary School, below the break, by Walk SF’s Natalie Burdick. I volunteered giving out stickers & the kids seemed proud to get one!